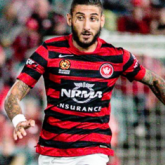 Bulut still has it, Elrich can't keep up with the A League anymore. If Tarek's brother Ahmed can get a run in the NPL (2) then Bulut has no excuse. He won't go from nothing to the A League - it has to be via the State League/s. Unfortunately or fortunately, as you see it, he needs FFA approval to play because of his drugs ban.